The Secret was a wonderful inspiration that introduced many people to the Law of Attraction. Filled with words of wisdom and insights, it can't help but inspire and motivate you to achieve your greatest dreams in life. 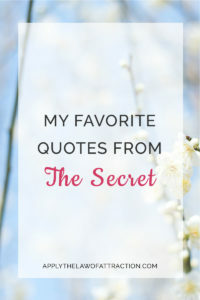 Here are some of my favorite quotes from The Secret I hope you enjoy them as much as I do. If you don't see your favorite listed here, let me know what it is in the comments at the bottom of the page. I’m so glad to hear it, Esmeralda! Thanks for letting me know. I have used the law of attraction correctly to recieve EVERY DESIRE I EVER WANTED SO FAR! Hey, I’m only a 19 year old girl. I have more of my life to live. The Universe will give me more of the things I want later when it is the right time and when my inner vibration matches it. Basically how I use the l.o.a to work for me is I’ve mastered my emotions and my thoughts. I literally FEEL the exact vibration I want to attract. Ya know how when ur young and u want a pretty bff? Or that new car or cute boyfriend? FEEL the exact way you would feel when u ALREADY HAVE THAT! If you don’t know how it feels to have something u want, observe, learn about it, do ur research (secretly) and explore other peoples feelings who have what u want. BUT NEVER STEAL, LIE OR CHEAT to rush into getting what u want!! If you do, it will only BACKFIRE LIKE A BI***! Honest to God! I’ve once tried lying and skipping steps to get what I wanted IN MY VERY PAST–but I’ve learned and grown and I know how to get what I want while being best friends and family with the Universe <3 If you truely trust and believe in the Universe or that God has your back. It will! Try visualizing what you want, feeling it, and don't forget to do this every day and say affirmations in the mirror. YOUR BELIEFS MAKE YOUR WORLD WHAT IT IS RIGHT NOW! So shift ur vibration! Create vision boards! Honestly, Vision Boards work like CRAZY WELL! I made a vision board specifically for getting a boyfriend and i put it away years ago. Now I have a loving boyfriend (and he's exactly what I wanted to attract! Kind soul, Christian, GREAT KISSER! Has a job, makes his own money and loves me for who I am!) I had forgotten about that vision board for so many years! All those years it was put away in a drawer, I spent my time visualizing myself in love with a cute boyfriend who would listen to me and kiss me <3 Then, just yesterday I opened my drawer and BOOM! I saw the exact same vision board I made to MANIFEST THIS DREAM COME TRUE!! I also manifested my car, my driver's license, money for beauty school, my makeup artistry certificate, my own beauty (i didn't know what I wanted to look like when I was a kid and I wanted to grow up beautiful!) Now guys all over think I'm gorgeous <3 I have guys asking me out on dates :") And I manifested my first Prom Date, my first kiss and a lot of fun and great stuff like my first job (i got 5 job offers in ONE DAY!!) Trust me! I know how the law of attraction works! And I can teach u success! But it will be a lot of work if u r already stuck in a negative space. Radiate joy and live in peace! Hi Christina, Your experience is inspiring. I’ve read and watched the Secret. I find it takes a lot out of me mentally and emotionally/ exhaustion, to try to “feel” what I want in life. I find it difficult to “feel” like Iv already got what I want. I think that’s why I’m stuck and loa is not working for me as fast as i’d like. Any suggestions? Quite Encouraging. Well, I would like to see the ‘Law of Attraction’ active in my Life. How to do it? All of these are amazing but there is one more that helped me months ago. “Take a leap of faith” I saw this one on their Insta page. Love it ? Great one! Thanks for sharing. I have long read the secret and put it away then became ignorant, what a loss! I suffered because I was ignorant and full of fear, I know how to sing and went for auditions and fear, negativity you know the results were imbarrasing, but today I am correcting my mistakes by the law of attraction I feel better I am even writing a novel, people who turned me away are beginning to call me back, because I feel peace and I have started reading to resit my AAT which I left because I was afraid to fail.